Use a one pint container of your favorite brand of cherry tomatoes. The tomatoes in the picture are cherry San Marzanos cherry tomatoes. If your dish is one that does not clean up well, use a little non-stick spray. Make sure you use a baking dish large enough to allow the tomatoes to sit in one nice row so that all the little tomatoes acquire a bit of nice roasty goodness. 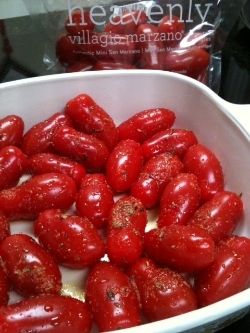 Toss all the ingredients together in a bowl, make sure to coat each tomato well, and then pour into a baking dish. Place the dish in the oven, uncovered, for about 30 minutes or until the tomatoes begin to brown and burst. These are absolutely delicious as a side dish or use them as a topping for a sandwich or a bean and grain casserole. 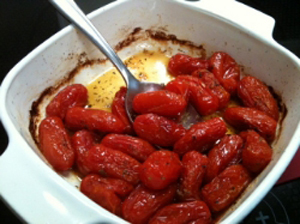 This entry was posted in Side Dish, Vegetable and tagged delicious, easy, roasted, tomatoes, work night. Bookmark the permalink.